This post is sponsored by HIPPEAS! All content and opinions are entirely my own. 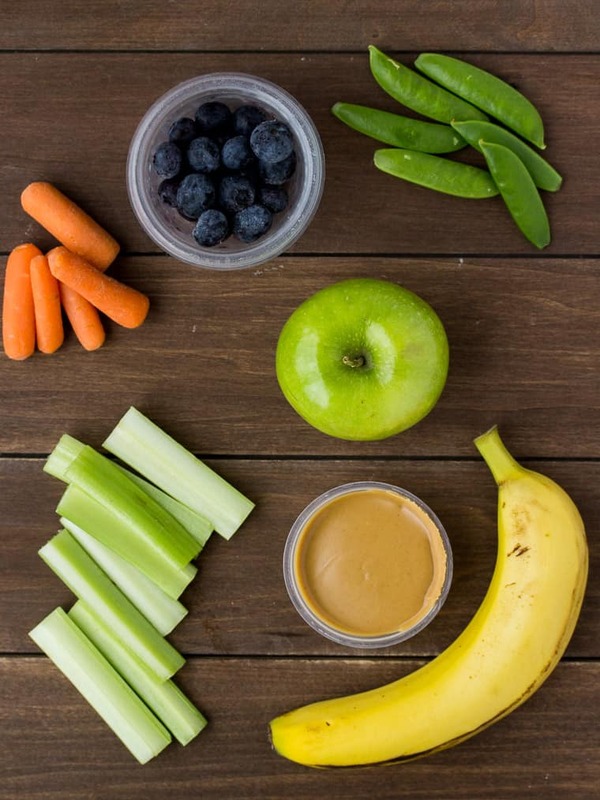 For your next big trip, try packing some of these healthy road trip snacks and drinks to keep everyone satisfied and happy! This summer, my family is taking a 2-day road trip. We will be traveling from Delaware to Florida with 2 kids in tow! There are two main road trip essentials that my family absolutely needs in order for us all to make it through this trip happy – entertainment for the kids and food for all! Since this is a mostly food blog and all, I’ll skip over the kid’s entertainment and get right to the snacks! The last thing I want on a long road trip are hungry, cranky, or overly hyper kids (and adults). These are my go-to road trip snacks to help keep everyone satisfied and happy without ruining any diets or sugaring up the kids! Fruit is a great sweet option for road trips that both kids and adults love. Be sure to pack fruits that pack well, like apples and bananas. If you bring more delicate fruits like grapes and berries, be sure to package them in resealable plastic containers to prevent them from getting squished! If you’re not too keen on packing whole fruits, try fruit leather made with 100% fruit and no added sugars! Vegetables are easy to prepare ahead of time for a road trip. Try red peppers, broccoli, carrots, celery, snap peas, cauliflower, or whichever veggies are your family’s favorites! If you or the kids don’t like vegetables on their own, there are individual serving size peanut butter cups for dipping available now! You can also pack little cups of cream cheese for dipping as well! Got a craving for a crunchy snack? 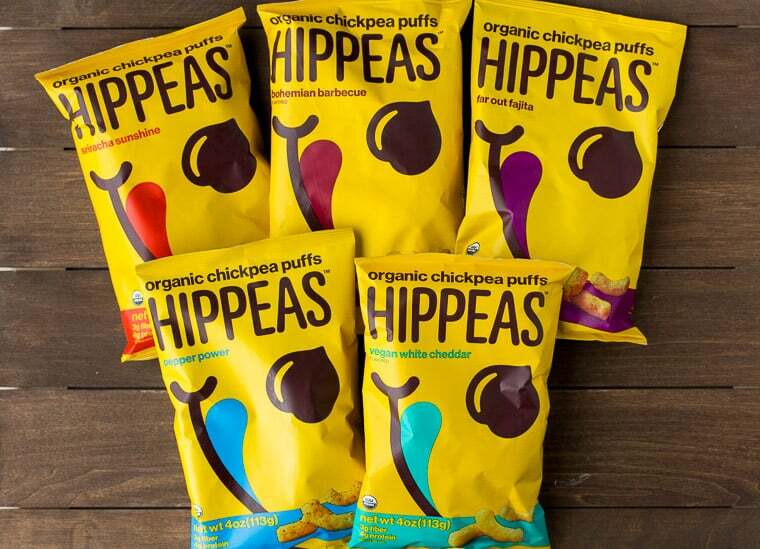 Look no farther – HIPPEAS chickpea puffs will take care of that craving and a lot more! They are so tasty! Seriously, one puff and we were all hooked. Why HIPPEAS? Well, for starters, they are organic, certified gluten-free, vegan, kosher, and non-GMO. Each serving contains 4 grams of protein and 3 grams of fiber. Also, they are just plain fun! Their motto is “Peas, Love, and Giving Back” and they are partners with Farm Africa which helps farmers grow their way out of poverty. 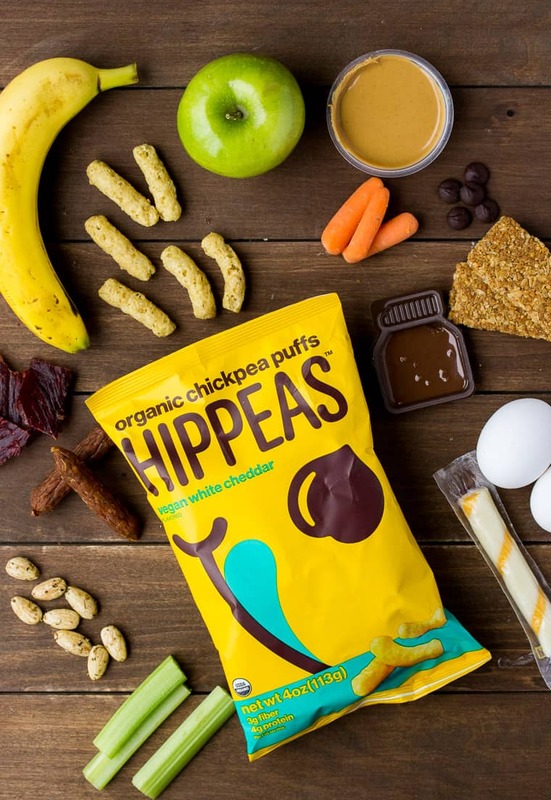 You can find HIPPEAS at over 30,000 retailers and online at Amazon.com! Check out the HIPPEAS Instagram page for more fun photos and information! 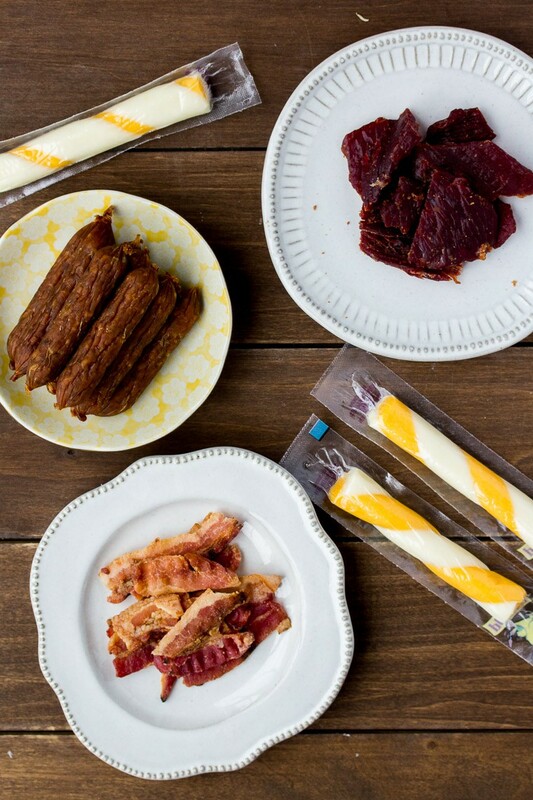 Beef jerky is a flavorful, protein packed snack for the meat lovers on your trip! It comes in a variety of different meats and flavors now, so you can easily find something for everyone. I just found fun breakfast sausage and bacon jerky varieties that would be a great mid-morning snack! Jerky also packs well and doesn’t require space in your cooler. Kids love cheese sticks, as do adults! Not only are they a delicious low/no sugar option, they are packed with protein and flavor. An added bonus – their slim packaging makes them easy to squeeze into a packed cooler! Granola bars and other types of energy and protein bars are a no-brainer for road trips! With a million different brands and flavors available these days, the options are unlimited! Even if you’re on a more restrictive diet, there’s a bar out there for you! They are easy to pack and eat on-the-go! Individual nut butter cups and pouches can be found alongside the peanut butter and jelly in your local grocery store. 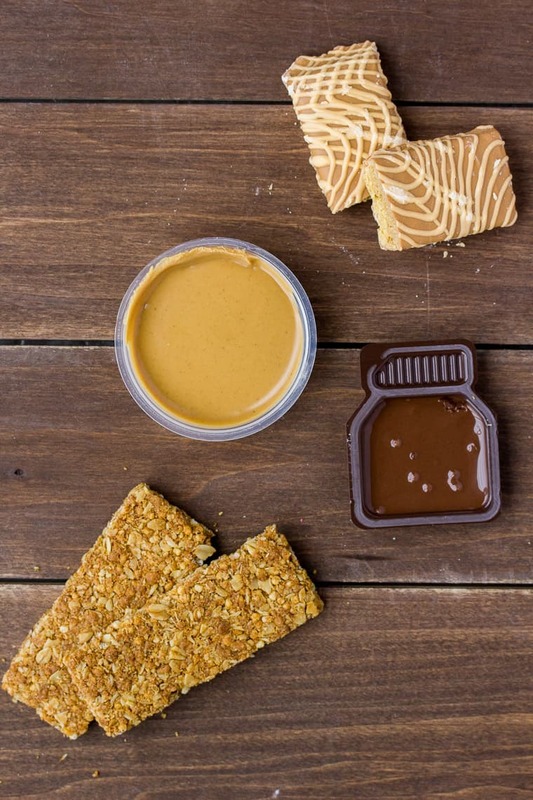 If you’re lucky, your store will carry a variety of flavors, including peanut butter, almond butter, and my personal favorite, chocolate hazelnut butter! These individual cup and pouches are great because they can be easily be eaten without a mess and provide a good amount of protein to keep you satisfied for longer. 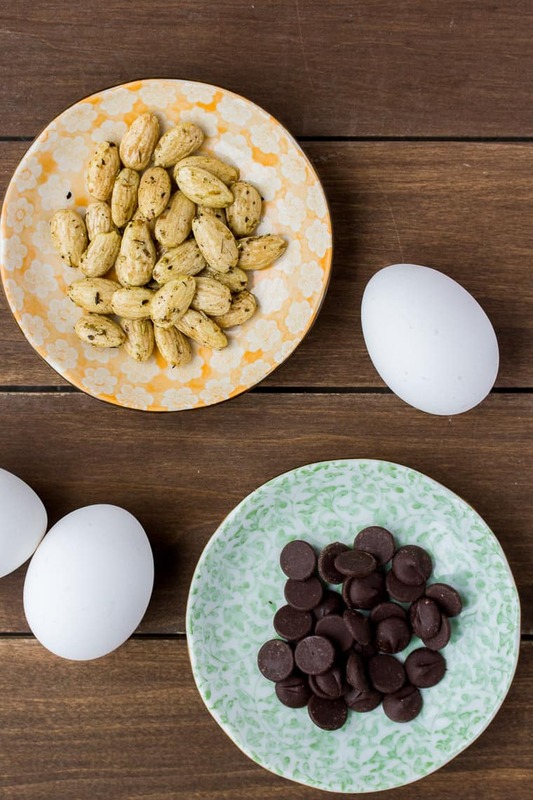 Hard boiled eggs are another great option for a punch of protein. A handy tip I’ve picked up along the way is to cook and peel them the night before. Pack them in resealable plastic containers to prevent them from getting smashed in your cooler. Nuts are an easy snack option for road trips. They provide a little boost of energy to help keep everyone chugging along! Plus, they taste great! Almonds and walnuts are some of the best choices. Check your grocery store shelves, as there are usually tons of yummy flavors to choose from now! Sometimes you (and/or the kids) are just gonna want something sweet. Dark chocolate has less sugar than milk chocolate and a small piece will help to settle those sugar-cravings. It’s also a nice option as a bribe to the kiddos when their lack of patience is getting the best of them! It’s super important to take the right precautions to keep your healthy road trip snacks, well, healthy! Here are some food safety tips to ensure your snacks stay fresh! Keep the temperature of your cooler at 40°F or below and your food will stay good up to it’s expiration date (just as if you were refrigerating it at home). Once the temperature rises above 40°F, the food is only good to eat for a couple hours. Use an appliance thermometer to monitor the temperature of your cooler. Only open your cooler when you absolutely need to and close it as soon as possible. If you are packing your cooler with ice, be sure food is packed in containers and packaging that is completely air-tight so that water doesn’t leak in as the ice melts. Use frozen bottles of water, juice boxes, or gel packs instead of ice. Pack your cooler as tightly as possible with food and ice packs to helps things stays as cold as possible. You are probably not packing raw meat on a road trip, but if you are extra precautions should be taken. You can either pack the meat in it’s own container, or freeze it first then wrap it thoroughly and place it at the very bottom of your cooler. 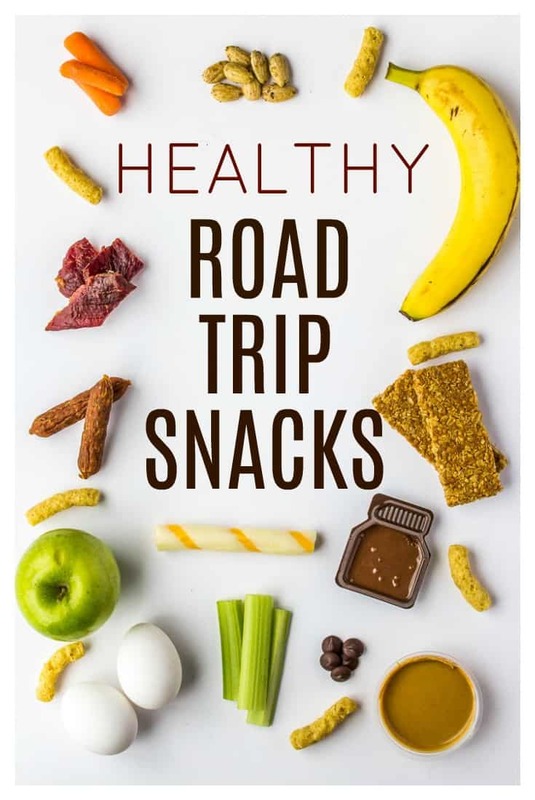 I hope that this Healthy Road Trip Snacks and Drinks article gave you some good ideas for your next trip! Follow me on Pinterest, Instagram, and Facebook for tons of recipes and other foodie posts!